When dandelion season comes around, it hits with full force! Looking around my garden, it’s hard to believe that only a few years ago there wasn’t a single dandelion on our property! Now we have ample dandelions to leave some for the pollinators, and still have enough dandelion flowers and roots to make into recipes. This dandelion soda recipe requires a bit of effort in stripping the petals from the plant, but you will be deliciously rewarded! Whenever harvesting any wild edible, you want to pay attention to where and how you harvest. Is there any chance that herbicide may have been sprayed on or near the dandelions? If so, move on! Once you’ve found a chemical-free source of dandelion flowers, for which you have permission to pick, leave at least 2/3 for the bees and other pollinators. 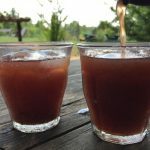 This dandelion soda recipe uses a ginger bug, which is a naturally fermented, wild yeast starter culture. The ginger bug, which is made of water, sugar, and organic ginger root, captures wild yeasts and provides the natural fizz of the soda. 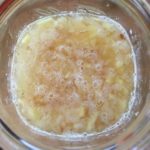 Be sure to read the full instructions on how to make a ginger bug starter and get your ginger bug fermenting before you are ready to make your dandelion soda. 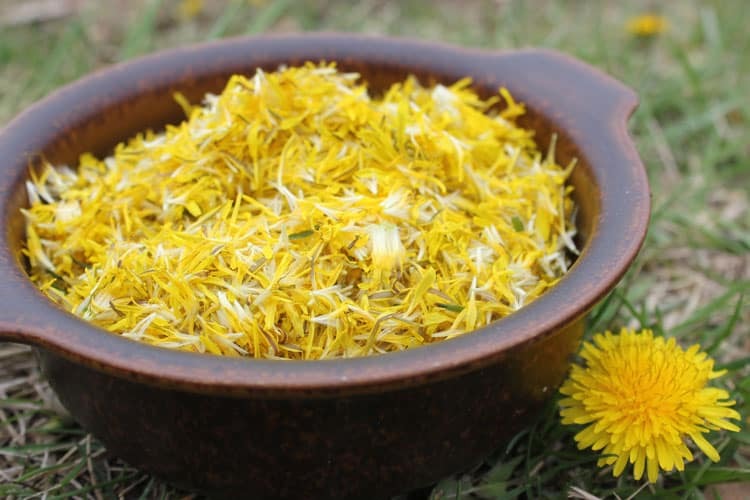 1) Harvest about 4 cups of dandelion flowers from a chemical-free area. Pick and save the yellow petals and discard the rest of the flower and stem. You will need at least two packed cups of petals. 2) Place the petals in a wide mouth mason jar. Bring 4 cups of water to a boil and pour over your dandelion flower petals (swirl some hot water in the jar so it doesn’t crack). Cover and allow the dandelion tea to steep overnight. 3) The next day, strain out the petals and gently re-heat the tea, taking care not to boil. Add the sugar, chopped ginger, and lemon zest and stir until the sugar is fully dissolved. Allow this syrup to cool completely. 4) Pour your sweetened dandelion tea/syrup into flip-top bottles and add the ginger bug starter and room temperature water. Gently swirl to combine, then cap the bottle(s) and place it in a room temperature water to ferment and carbonate. Your ginger bug is a very vigorous starter culture and carbonation can take anywhere from one day to one week. In warm weather, err on the side of caution and assume that your soda will be amply carbonated after one day. 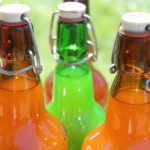 Important Safety Note: The process of natural fermentation/carbonation creates pressure inside the glass bottle, and therefore carries some risk of explosion. 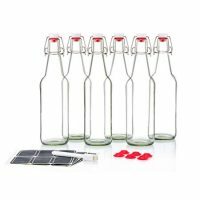 Pay close attention to the status of your carbonating dandelion soda, checking on it and “burping” it daily by carefully opening the lid to release excess carbonation. 5) Carefully check on your soda each day and when it has sufficiently carbonated (the top will “pop” when you open it, and you may see small bubbles in the liquid, again this may only take one day), transfer the soda to a refrigerator and drink within a few days. My dandelion soda recipe is, of course, scalable! If you have a yard full of dandelion flowers and willing helpers to pull petals, feel free to double or triple the recipe! Also, you may decide to augment the flavor with some lemon juice or spring herbs. 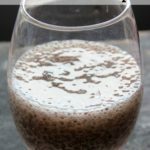 Keep the proportions of liquid to ginger bug starter about the same, but otherwise feel free to experiment! 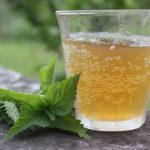 You may also want to try my herbal soda recipe (also all-natural!). 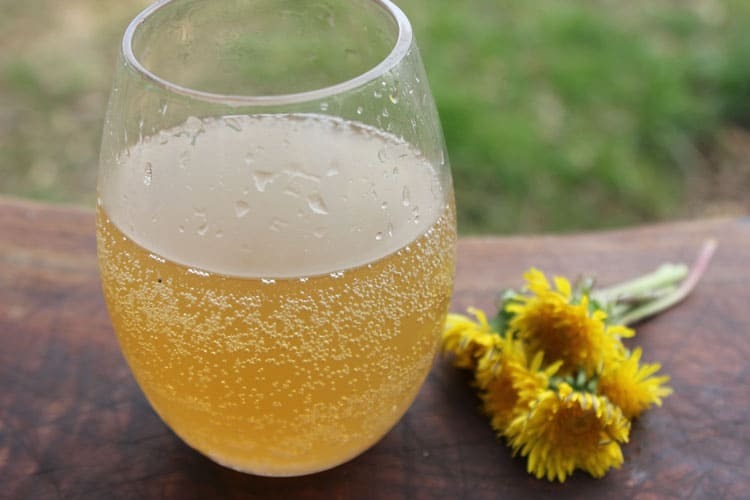 This dandelion soda recipe requires a bit of effort in stripping the petals from the plant, but you will be deliciously rewarded! Harvest about 4 cups of dandelion flowers from a chemical-free area. Pick and save the yellow petals and discard the rest of the flower and stem. You will need at least two packed cups of petals. Place the petals in a wide mouth mason jar. Bring 4 cups of water to a boil and pour over your dandelion flower petals (swirl some hot water in the jar so it doesn’t crack). Cover and allow the dandelion tea to steep overnight. The next day, strain out the petals and gently re-heat the tea, taking care not to boil. Add the sugar, chopped ginger, and lemon zest and stir until the sugar is fully dissolved. Allow this syrup to cool completely. Carefully check on your soda each day and when it has sufficiently carbonated (the top will “pop” when you open it, and you may see small bubbles in the liquid, again this may only take one day), transfer the soda to a refrigerator and drink within a few days. My dandelion soda recipe is, of course, scalable! If you have a yard full of dandelion flowers and willing helpers to pull petals, feel free to double or triple the recipe! Also, you may decide to augment the flavor with some lemon juice or spring herbs. Keep the proportions of liquid to ginger bug starter about the same, but otherwise feel free to experiment! I love this idea! I’m not really into wines, and that is mostly what you find for making beverages with dandelions. The only thing I really miss when I switched over to an organic, healthy diet was my Coca Cola!!! NOT Pepsi. (haven’t had one for about three decades or more, and I STILL miss the taste!!!) Dandelions are so beneficial to us and wildlife, and I hope to make some of this soon. Thanks for the recipe!!! What and where can I get ‘ginger bug’?